For whatever reason I love mixing together badly constructed Spanglish phrases. It just sounds funny to me, and if you’ve ever seen any Spanish language dramas, you’ll know adding just a few Spanish connecting words triples the drama. “The saga of the tooth” is boring, but change a few words to “El saga del tooth” and now you’ve got intrigue, suspense, drama, and even some of that famous Latin sexual tension! So, with that steamy drama firmly established, here we go; Over the years I’ve had a lot of dental work done. About a year ago I became a 1980s rapper with the solid gold crown I had put on my lower left wisdom tooth. Dentist: Oh, do you have all your wisdom teeth? Dentist: Ok, which one is bothering you? Dentist: Ok, work out a schedule with the receptionist so we can get you in here and get that taken care of. Receptionist: So we’re going to have you back for an extraction on the 30th. Me: I don’t want an extraction, I want a filling. Dentist: Why? Nobody needs their wisdom teeth. Me [angry now]: Look in my mouth. I have room to spare. I use those teeth to chew food. I’d say that qualifies as a “need”, don’t you? However, this story isn’t about wisdom teeth. 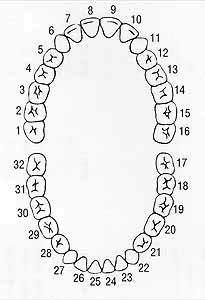 My number 3 and 14 molars are kind of a funny story. They were both given root canals and both filled with mercury amalgam. This metal expands and contracts with temperature changes, ultimately cracking those teeth and weakening them to the point that all the cusps cracked off and cavities started eating away at them. Several years ago the one on the upper left (14) started to hurt, bad. It started on a Friday evening, and by Saturday morning I was on my knees. The pain was in my upper jawbone, just below my eye and sinus. The roots of the 3 and 14 molar teeth extend up into the jaw and come very close to the sinus lining, so it’s not uncommon for people to have sinus problems connected with problems in those teeth. I called my dentist at the time but he was out for the weekend and all I could do was keep putting Anbesol on the gums around the tooth and laying on the couch slowly losing the will to live. By the morning, my gums had literally started to rot away from all the Anbesol I’d put on them, and I could no longer put anything close to my tooth (including more Anbesol) without it hurting. I endured an entire weekend of the most painful pain I’d ever experienced in my life before or since, and when Monday finally came I was on the front doorstep of my Dentist’s office for an emergency visit. The pain of getting a numbing shot is usually uncomfortable, but this time it was unspeakable. After getting the mammoth shot, I remember the longest wait in my life as the pain slowly started to subside as the numbing agent went to work. The dentist told me he could do another root canal or remove the tooth. I immediately told him to pull it. Just yank it out. After some confirmation questions, he started to get to work. He first sectioned the tooth with some kind of grinding wheel or special drill bit, then cracked it, then removed the roots one at a time. Thinking back it was quite comical because he had to put his foot up on the dental chair and yank with dental pliers, nearly flying back into a rack of equipment each time a root finally gave way with a very loud pop! sound. 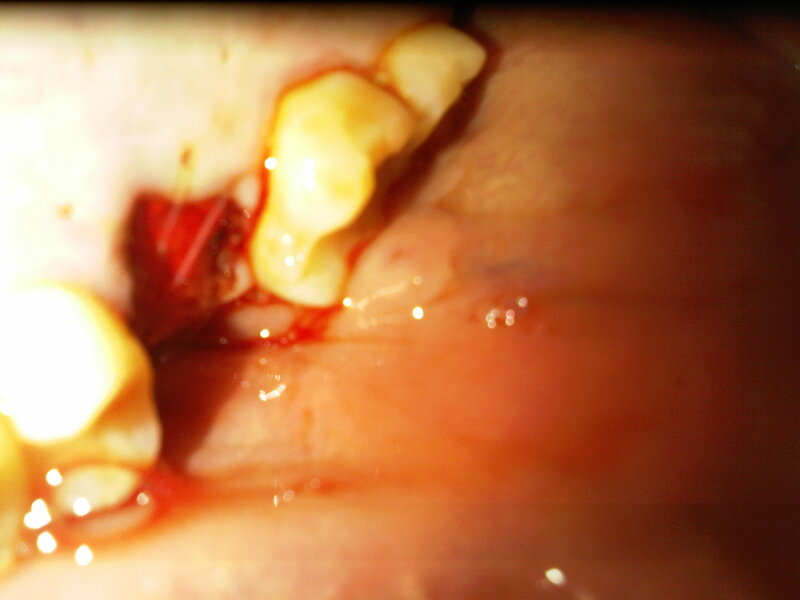 Once everything was out, he found that part of my actual jaw bone was starting to turn to jelly due to the infection. After grinding on the bone to remove the jellied bits, he sewed me up and gave me a prescription for some pain meds. I laughed and told him that after that kind of pain, a little bone grinding means nothing to me. I never did end up taking a single pain pill for that misadventure. That tooth is still missing, and things are fine with it. However, a few months ago I started to get a slight pain in the sinus area right above number 3 (yeah, it’s the same molar on the other side). This time it was a much slower progression, so I was able to see my dentist, then an endodontist (root canal specialist), then finally an oral surgeon. 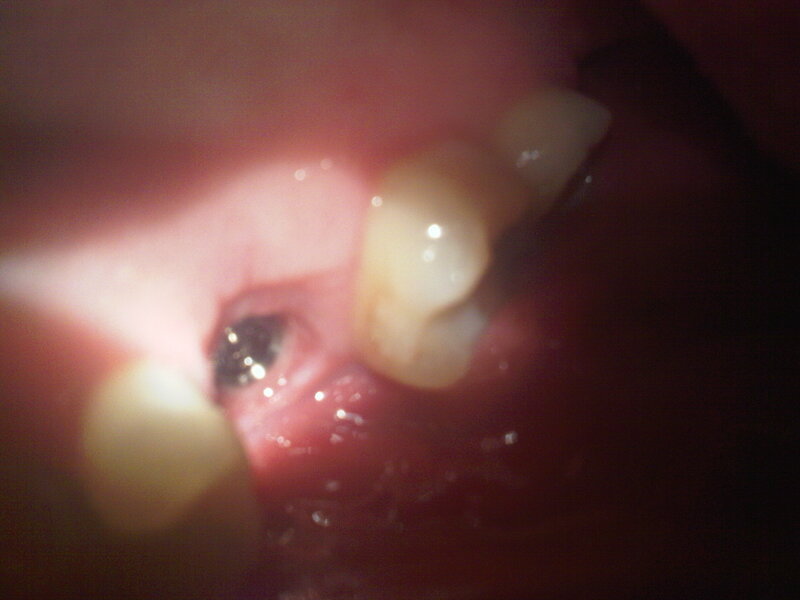 I settled on getting my tooth extracted and a post implanted into the hole. Even though this process is more expensive, the end result is a much more permanent solution. It also does not involve or damage the surrounding teeth like a dental bridge does. The first visit to the oral surgeon was to confirm that I did indeed want the surgery done. This was a complete waste of $80. I sat around for an hour in a dental chair. Finally the guy comes in, takes a quick glance at my x-ray films (really, just a glance), then asks “So, you want to get an implant?” to which I reply “Yep.” and that was it. He walked out and that was $80. I didn’t even get a complementary tooth brush! When it finally came to getting the tooth extracted and the implant put in place, it took all of 30 minutes. 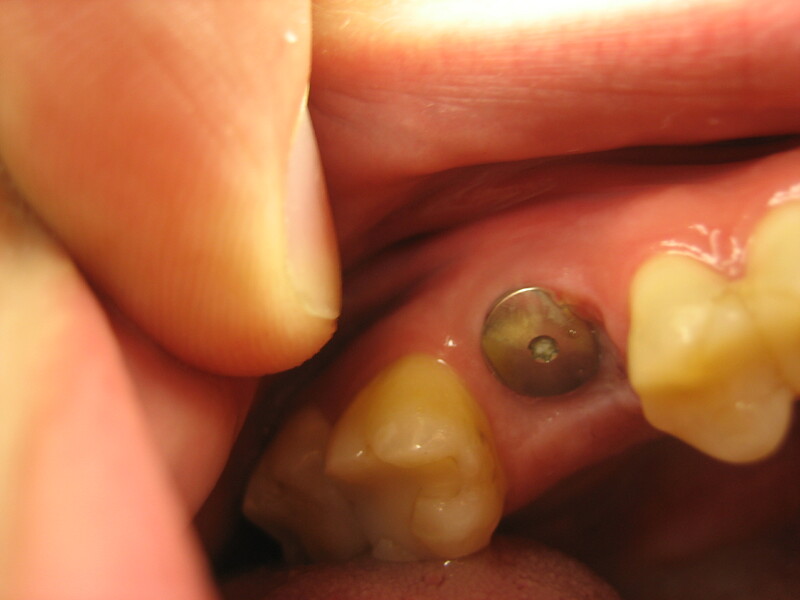 The top of the tooth was cut off, then some light tapping, then the roots were extracted. The method was slightly different, twisting the roots around to get them out. The first extraction I had involved a lot of straight pulling and popping sounds, but this was quite a bit easier to deal with. 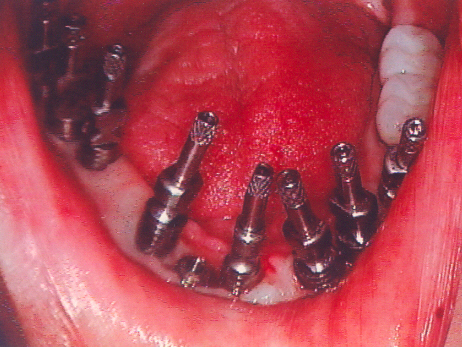 Once out, my sinus membrane had to be lifted so the implant would not damage my sinus lining. After the lift kit was placed and some hammering done (which was somewhat disturbing), some additional poking around was done, some suction, and finally them metal implant was wrapped in a bone growth matrix “cloth” and inserted. Then some gauze was placed over top of the whole mess and some dissolvable sutchers were sewn over top to hold everything down like straps holding a tarp down on the back of a truckfull of garbage (yeah, nice clean metaphor I know). After about 3 days the sutchers fell apart and I pulled the loose bits out and tossed the gauze. The implant itself is really just a threaded cylinder that the post will eventually screw into. Sorry for the fuzzy image, my breath was fogging up the lens! So, with that in place, a “healing abutment cap” (which is really just a screw), is threaded into the implant cylinder and gives a raised edge for the gums to grow around but not over top of. Well a few days ago that screw became loose and food was getting under it, which caused such a foul smell I had to remove the screw and clean things out. After cleaning the abutment and swishing my mouth out about 50 times, things were all cleaned up and ready for rethreading. Once the thing was finger tight, I went to my tool box and got the smallest Allen wrench I could find. It fit perfectly and I was able to tighten down the abutment pretty good… probably too good. Unlike most screws where it gets more difficult the closer to “tight” you get, the abutment cap came to a very sudden stop when it was finally tight. 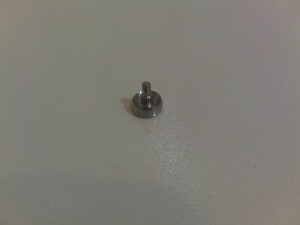 That put some pretty good stress on the implant that was screwed into my jawbone. I’ll never forget the crunchy sound it made… which is probably not a good thing. So, I’ll just keep taking my calcium supplements and I’m sure things will be all ready to go by the time the post gets put in. I hope they use loctite or something! So this procedure marks the third implant in my body to date. I’m not necessarily happy about having more “stuff” in my body, but I did take some small amount of contented joy over being able to fix the problem myself. I mean, I just could not escape the simplicity of it. Regardless of the fact it was not really a part of my body I just hunkered down with a 39 cent hardware store tool, my mind still wandered to thoughts of an android future where your own parts can be worked on in your own garage. I guess I just got the same kind of satisfaction you get from working on your own car, instead of needing to rely completely on a mechanic. Still, the reality is that an animal body (human, dog, cat, etc. ), for all it’s apparent frailness, it one of the most complex and impressive self-repairing machines to ever exist. Also, ending up like this guy is not an appealing thought either. This entry was posted on Saturday, April 11th, 2009 at 11:58 am	and is filed under Personal Health. You can follow any responses to this entry through the RSS 2.0 feed. You can leave a response, or trackback from your own site. Great story. Just had a root canal done on a tooth that was drilled too deeply by a (bad) dentist. Got an abscess in so needed the root canal. Now will need a crown on that sucker. Good to hear my problem is relatively minor. Sorry you had to put up with all this shite, though. *sigh* Some dentists really shouldn’t recommend an extraction as soon as a potential patient says “wisdom tooth”. I’m sure they know there are people who have enough space for wisdom teeth (even though they are admittedly rare).